It rained almost all day Sunday, so needless to say I didn’t get my long run in at the start of the week. I did however, go long on Monday morning. I woke up without a doubt in my mind that I would go out for a run. I met up with a BGR! Columbia member at 5:00 am and we headed out for a 12 mile run. We didn’t quite make the 12 miles but I did get in 11. Yeah I know I could have stayed a little longer to get in that last mile, but I was late getting back home to get ready for work. Hey looks like my energy has turned around…this was a great run!!! Tuesday was another great running day. I met up with two other ladies from BGR! Columbia and we got in 3-5 miles in the rain. Yes I love running in the rain (light to moderate showers) it brings out my inner bad azz!!! On Wednesday I decided to take a rest day, sometimes we have to listen to our bodies and I did just that. There was a #RunForJustice event going around on Facebook, where participants would walk, run or bike 4.5 miles in honor of Michael Brown (he laid on the ground for 4.5 hours after being gunned down). 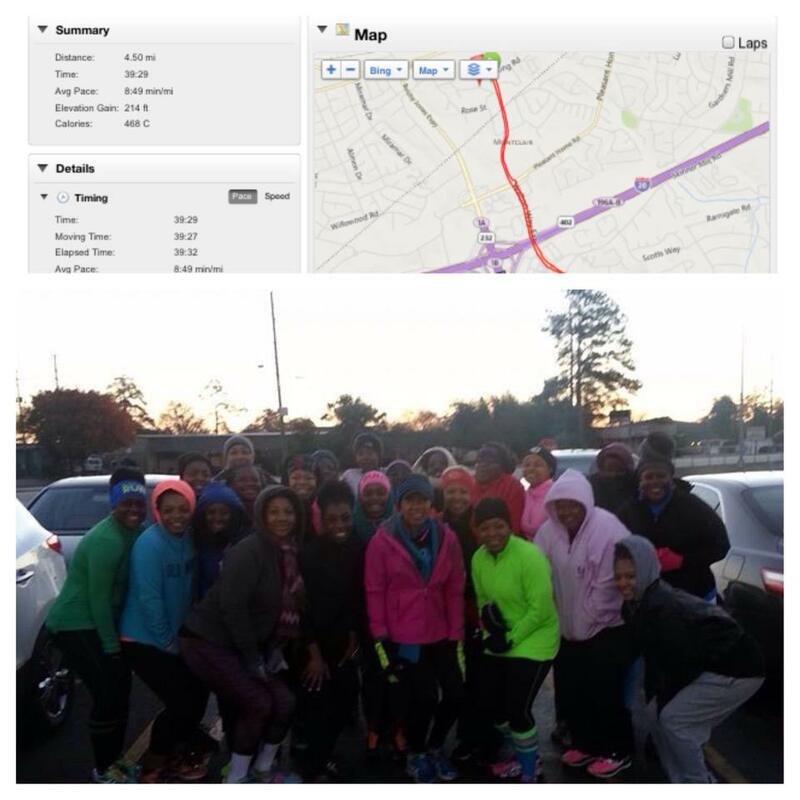 So I decided to do my run on Thanksgiving day because I knew I was going to meet the ladies of BGR! Augusta since I was in town for the holiday. It was very windy and cold out Thanksgiving morning but BGR! Augusta still showed up to pound the pavement. We got in between 3-5 miles that morning. It was great being back on the pavement with my BGR!Augusta family (this is where I got my start). 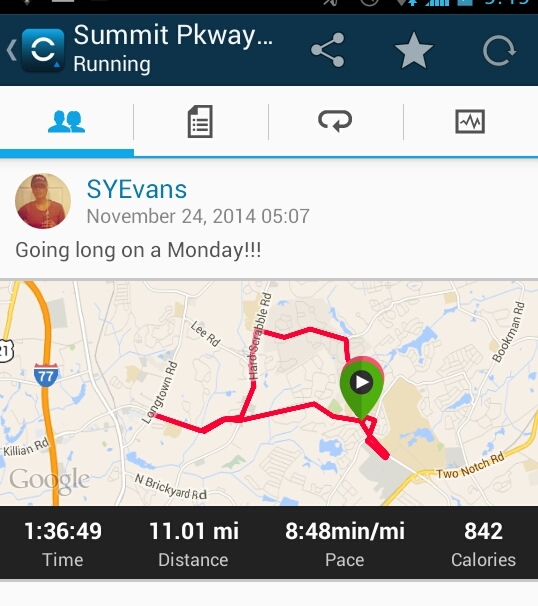 Got in a nice run with my girl Yvonne in Grovetown on Friday morning. Grovetown is where my running journey began, so anytime I get a chance to run the streets with the ladies of Grovetown, I make it happen. My goal for this run was just to run with Yvonne and not worry about my pace …I really enjoyed just taking in the scenery. Yvonne was able to cross off running to Walmart from her running bucket list. 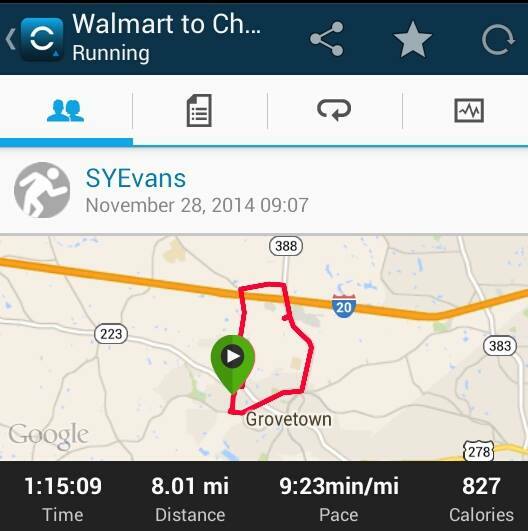 I’m not sure what it is about running to Walmart but if you are a runner and live in Grovetown…it is a must do!!!! All in all this was a great week for running. I really felt like I had my mojo back. This week coming is race week and I still have to get in about 30 miles before my run on Saturday….BUT I’M READY!!!! Next Article Running, Yorkies and Playbills…Finally Race Week is Complete!!!! Hey thanks Brittany!!! I think I found my mojo….how is your running going?